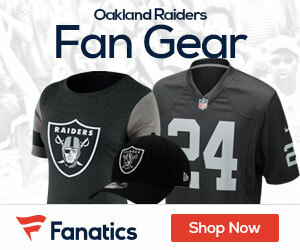 The Oakland Raiders, by and large, are an unlucky team that happens to be offensively challenged, as well. And as luck would have it, they on Sunday would have to host the Cincinnati Bengals over at Oakland-Alameda County Coliseum. The Bengals’ rushing attack was better than expected and their run defense stopped the Raiders, for the most part. First glance would tell you that the Bengals romped, right? Not so fast. Despite the Bengals’ advantage in yardage, apparently the football gods for once were smiling down on Oakland as the Raiders’ special teams saved the day; Brandon Myers forced a Bengals fumble, allowing kicker Sebastian Janikowski to kick the game-winning field goal with 15 seconds left in the game which gave Oakland the 20-17 upset of Cincinnati. The first quarter was uneventful as the only scoring that took place was a 1-yard touchdown run by Bengals QB Carson Palmer, giving Cincinnati a 7-0 lead; Palmer would score from a yard out again with 7:!2 left in the second quarter, boosting the Bengals edge to 14-0. With just under a minute left until halftime, tight end Zach Miller scored on a 10-yard TD pass from Bruce Gradkowski, starting in place of JaMarcus Russell, which put Oakland within 14-7. The third quarter was a battle of attrition as field goals by Shayne Graham and Janikowski made the score 17-10 Cincinnati; things started looking up for the Raiders as Gradkowski tossed a 29-yard TD pass to wide receiver Louis Murphy, tying the game up at 17-all. The defining moment happened with the Bengals’ Andre Caldwell coughing up the ball, with the Raiders’ Brandon Myers recovering the ball. 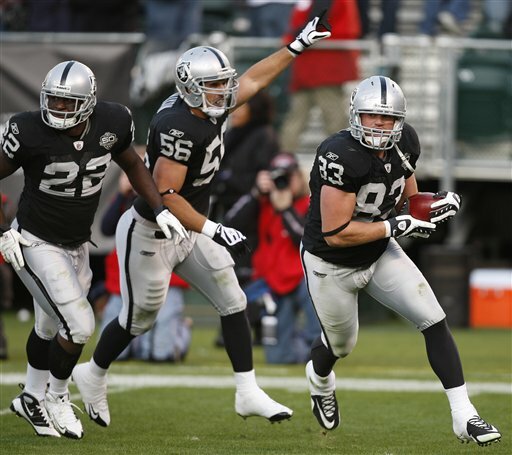 That would set up the game-winning 33-yard FG by Janikowski with 15 seconds left, sealing the win for Oakland. Gradkowski had mediocre numbers, going 17-of-34 for 183 yards with 2 TDs and an interception while Palmer went 14-of-22 for 207 yards with an INT. Justin Fargas led the Raiders rushers with 32 yards; Bernard Scott led Cincinnati’s rushing attack with 119 yards while Brian Leonard added 36 yards. Miller led the Raiders receivers with 5 receptions for 65 yards and a TD while Chaz Schilens caught 2 passes for 41 yards; Cincinnati’s leading receiver was Chad Ochocinco with 4 receptions for 67 while Laveranues Coles caught two for 61 yards. Oakland (3-7) plays again on Thursday when they visit Dallas to take on the Cowboys while Cincinnati (7-3) hopes to rebound as they return home to host the Cleveland Browns next Sunday.